Before she became a renowned humanitarian, conservationist, and animal activist, Dr. Jane Goodall was a little girl with a special toy chimpanzee named Jubilee. 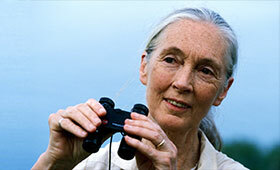 Accompanied by Jubilee, Goodall went on outdoor adventures and observed the miracles of nature. As she learned from her expeditions, young Jane dreamed of spending the rest of her life living with and helping animals in Africa. Later, she would do just that. Me … Jane, based on a Caldecott Honor Book by Patrick McDonnell, is the true story of the young Goodall, who as an adult scientist has spent more than half a century studying the social and family interactions of wild chimpanzees. This musical production—adapted by Andy Mitton, Aaron Posner, and McDonnell—shares how Goodall believed in herself, lived her dreams, and made a difference in the world. Since 1992, Kennedy Center Theater for Young Audiences on Tour has been a leader in bringing imaginative and original works to communities around the United States. The program has mounted more than forty tours that have reached two million-plus people in forty-nine states and parts of Canada. The Kennedy Center Theater for Young Audiences on Tour is represented by Shaw Entertainment Group, LLC. This event was originally scheduled for Saturday, January 12, 2019. Before she became a renowned humanitarian, conservationist, and animal activist, Dr. Jane Goodall was a little girl with a special toy chimpanzee named Jubilee. Join us for a story hour presented by the Center for the Performing Arts at Penn State with support provided by Steven L. Herb and Sara Willoughby-Herb. After learning about the young Goodall and how she followed her dreams, families will have the opportunity to create art books inspired by observations of their favorite animals. Children must be accompanied by an adult. Reservations are not required. Attendees will have a chance to win a family four-pack of tickets to see The Kennedy Center Theater for Young Audiences on Tour presentation of Me … Jane: The Dreams and Adventures of Young Jane Goodall at 4 p.m. Sunday, February 10, in Eisenhower Auditorium. Children must be accompanied by an adult. Reservations are not required for this event. Kids Connections, which is free for ticket holders and includes a craft-centered, child-friendly activity provided by Penn State’s Matson Museum of Anthropology, takes place one hour before the show. Due to space and time restrictions, Kids Connections participation is limited. Watch a preview of Me … Jane.